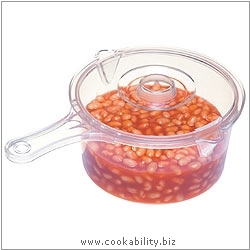 A stain resistant, non-stick microwave saucepan made from 100% food safe material. 900ml capacity. The lid has two side stoppers allowing it to be closed for storage in the fridge. Dual pouring spouts for right and left handed use. Freezer safe.